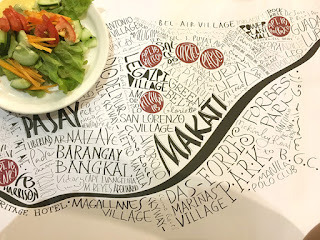 My husband flew in two weeks ago to celebrate his birthday in Manila. So I made sure that all of his requests were fulfilled during his short 3-day vacation. From satisfying his food cravings to getting his requested spa treatments, Rubel returned abroad with a full and gracious heart. He felt revitalized, and was ready to go back to work. 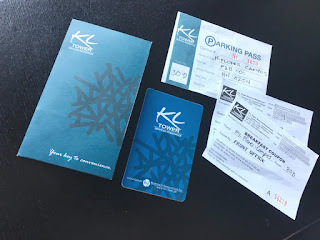 But out of all of our plans, he enjoyed our staycation in KL Tower Serviced Residences the most (also known as the Kalaw-Ledesma Tower). He was beyond ecstatic when I told him that we were staying in a One Bedroom Loft. Staying with the HII managed property, even for just a night, was beyond amazing. Up until now, I can still remember how nice it was to be given a personalized service -- from being ushered into our lovely accommodation to being greeted with the warmest of smiles. And besides being ‘wowed’ by our room's impressive floor-to-ceiling glass windows and modern chic interior decoration, the KL Tower team also impressed us with their cute gifts (Eco bags, Chocolate Mangoes, Villa del Conte chocolates for my husband's birthday). We've simply experienced the best from this establishment. KL Tower Serviced Residences definitely topped my list of favorite accommodations in Makati. We truly valued the time and effort that they’ve extended to us, just so we would feel at home. And we just can’t help but feel grateful for a time well-spent with them. Our high-ceiling One Bedroom Loft was exquisite, as it exuded warm and earthy tones, and a great set of modern chic furniture. The attractive receiving area and the floor-to-ceiling glass windows, which has access to a balcony, were also just as impressive. The loft was certainly big enough to accommodate 2-3 occupants, so it was perfect for me and my husband. Though the stairs that led to the bedroom was too steep for us. But it was forgivable, as it gave us an instant leg workout. The bedroom (and a seperate home office), which was located on the second floor was the perfect space for two. It also had big mirrors (one by the headboard and one near the cabinet), and a closet that contained several home essentials (i.e. flat iron, ironing board, hair dryer, safe). Our Queen-size bed, which was complemented with a handpainted black bed runner, also had just the right proportion. The soft pillows, the thick blanket and the comfy mattress certainly gave us the best sleep we've had in days. *NOTE: Not all of the lofts at KL Tower have the same configuration, as some of the apartments were built in different parts of the building (this also applies to all the other room types). So should you want to stay in this exact space, you can show this review when making your request. And did I mention that we had two en suite bathrooms in the apartment? Every floor had one of each, complete with a shower, toilet, towels and complimentary toiletries. It was actually nice to have a washroom on every level of the house because there's always one that is readily accessible. As soon as we settled in, we hurried out to buy some groceries for our dinner date at home. Rubel promised to cook me his special Rib-eye Steak. So it was perfect that we had our own kitchen in the apartment. It was also fitting that KL Tower was only a short walk from Greenbelt 1 Mall, where a Rustan’s Supermarket was accessible. But since there weren’t many options when it came to our preferred meat and vegetables, we decided to walk to the nearby Landmark Supermarket for more food choices. We actually felt grateful that KL Tower gave us two sturdy eco bags, which we were able to use for our grocery haul. Rubel started preparing his store-bought ingredients as soon as we got home. He couldn’t contain his excitement to cook his Salt & Pepper Rib-eye Steak, so he got right into seasoning them. Unfortunately, so much smoke was produced from the pan while searing the steak, that we set off the smoke detectors, which prompted a visit from the Guards and Fire Marshalls. Sadly, the exhaust fan of the electric stove couldn’t handle all the smoke. So we had no choice but to open the window and fan the fumes out of the pad before cooking again. Despite our cooking fiasco, we were still able to enjoy what we prepared that night, while we drank our chilled red wine. It actually helped that the Makati skyline was beautiful that night, as it exuded a calming ambiance. Not only did KL Tower design each of their serviced residence with chic and stylish interiors, the inclusion of a gorgeous blue-tiled, indoor swimming pool in the building (7th floor) can also be accessed and used by in-house guests. We no longer had time to try the pool. But an earlier visit definitely made us want to dive right in because it looked so refreshing and inviting. It was actually nice that we were given a personal tour of the other serviced residences in KL Tower (special thanks to Ms. Kathy!). So we were able to see some of the spaces firsthand. You can expect to get the same in-room amenities regardless of the room that you'll decide to book. In-room amenities: Kitchen and Dining Area, Cooktop and Crockery, Mini Bar, Microwave Oven, Safety Deposit Box, Cable TV, Wi-Fi Internet Access, IDD/NDD telephone facility, Hot and cold shower, Individually-controlled aircon, Hair Dryer, Balcony (selected rooms), Complimentary Bottled Water, Coffee and Tea. Rubel had to miss breakfast since his flight the next day was super early. Good thing my brother Choy, and his girlfriend Cathy decided to stay with me until check-out (they drove us to the airport after their shift at work). So the three of us got to eat at Kitchen 1B. KL Tower gave me two complimentary breakfast vouchers, which Cathy and I used. Choy just ordered something from the regular menu, which I paid separately. Anyway, while our main dishes were plated (our Beef Tapa and Adobo Flakes were delicious), the vegetable salad, fruits and bread stations were offered buffet-style. KL Tower Serviced Residences is perfectly situated in Makati, as it is near several landmarks in the city such as the Legazpi Active Park and Washington Sycip Park (both are just right across the building). The property is also near the Legazpi Sunday Market, Greenbelt Malls, St. John Bosco Parish and Makati Medical Center. 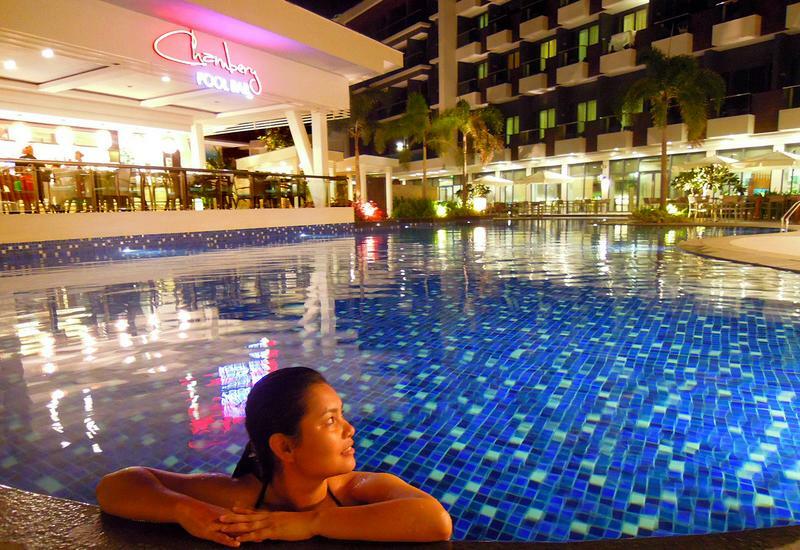 It is also 8 KM away from the Ninoy Aquino International Airport. If you need to make the most of your days while in Manila, stay at KL Tower Serviced Residences, as they offer the comfort of a deluxe hotel at a fraction of a price. It’s about time you stay at KL Tower Serviced Residences, as we highly recommend this HII managed property. Note: This is a sponsored stay with KL Tower Serviced Residences. (Budget Biyahera) I do not represent the thoughts, intentions, plans or strategies of the establishment or its owners. All views and opinions shared on this website are solely my own.